The other day, I was having lunch at Urban Bean in my building, here in Calgary. As I was waiting for my soup to be poured, I wandered over to a table with several magazines on it. One of them looked like a “teeny-bopper” Justin Bieber kind of magazine. You know the ones, right? They’re really flamboyant, with different neon colours. What was interesting was this magazine was strewn in with two other business magazines? So this is downtown Calgary … what the heck is this magazine doing here? When I got to the table, I immediately picked up this magazine and guess what. 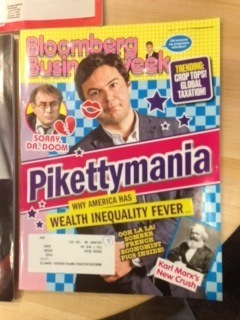 It was Bloomberg Businessweek! Bloomberg could have made a “serious” magazine cover, like they’ve always done. They could have included intuitive headlines, which they’ve always done. But they didn’t. Why? Because they wanted to deploy a style of “Pattern Interrupt“ marketing. If I’m browsing magazines, cruising through TV channels or looking at open houses on a weekend, I develop a pattern. When I’m operating in a regular pattern I tend to zone things out, skim and miss things that could be really important. In marketing, if I can interrupt this pattern, grab my prospects attention and control their focus I am better equipped to deliver my marketing message. In Bloomberg’s case, they wanted to have their magazine stand out and be picked up. I picked it up. And I read it. Our Realtors, our mortgage prospects – everyone – is hearing the same message of “great rates, service and access to 50 lenders.” They’re skimming over our messaging, tuning us out and ignoring us.